In this article I briefly describe the operation of the real train service, from the models that I operate on this module. Then I will show my plans of a 4 x 8 feet module, which connects to the main layout. I have started building the Belgium part of my layout. To see it's progress, and the many plan changes, check out the second Belgium article. This picture, from Phil Richards, shows a little of what I have in mind, when it comes to the train station. It will be small and romantic. The surrounding area in front of the station will be of typical Belgium houses, as shown at the background. Of course it will be complete with bars / pubs and a "Belgium fries" snack bar. Click here to learn all about Belgium Fries. The "sluis", just past Roosendaal, with a dog nose. Since the overhead system is different then in the Netherlands, it will be modeled with Belgium overhead system. 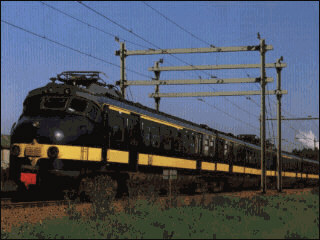 In Belgium the trains operate on 3000 Volts direct current as compared to 1500-Volt direct current in the Netherlands. To accomplish this, the trains are able to drive on both power systems, and to prevent a short circuit in the train, a wireless / powerless section is installed just before the border past the city of Roosendaal in the Netherlands. 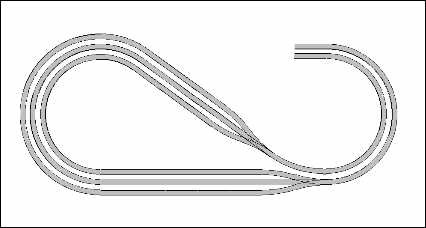 Trains will pass this section with the pantograph's) down, cruising so to speak, and switching to the other system. 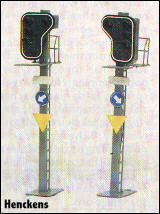 Also the automatic safety systems used in Belgium and the Netherlands are different, just like signals. This will be modeled accordingly. Structures and vehicles will have a Belgium look. In the center of this module a small hill will be created to separate the module optical in halve. Some Belgium trains will be placed, at the depot, for show. 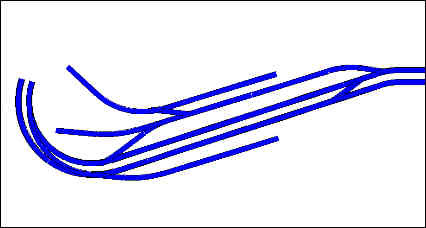 The first generation push-pull mode train, which I have already modeled. 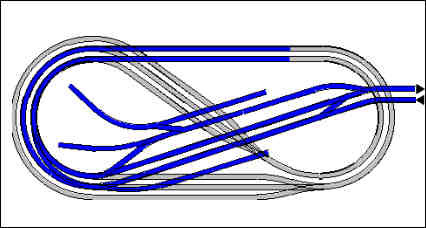 The second-generation push-pull mode train. Lima released a model of this set. The Edelweiss, from Amsterdam to Zurich, via Brussels. 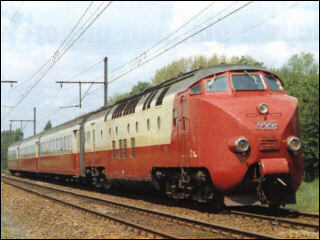 This Trans Europe Express diesel train set just like the Etoile du Nord and various other international express trains (D-train), used to cross the border at Roosendaal. This train set is later sold to Canada, and was in service as the Northlander. Click here for the history of the TEE - Northlander and the future of the TEE, which will be brought back in it original livery. Marklin released a Ho scale model in the TEE and Northlander livery, the later being an expensive collector item. Especially for the Dutch and Belgium "Benelux" trains, these are special international Intercity trains that are owned by both railroads and run between Amsterdam and Brussels, I make this module with a staging yard for three train sets. The visible track, on the drawing bleu, will be located in a Belgium landscape, with a small station. Trains won't stop here to give it the Intercity character. Trains drive on the the left track, just like they do in Belgium, and some other parts of Europe for that matter, in the Netherlands they drive on the right track. This module attaches to the main layout, but is meant to be a staging area where the trains turn around in turns. Here are some of my models that will be in service on this part of my future layout. I will add some Belgium train models, I am also thinking about kit bashing a class 52-53, from two American F7a locomotives. The Marklin TEE diesel train set still has to be rebuild to direct current (DC) operation, from which I write an article when I start that project. The total number of trains is four, and that's one reason I include a three-track staging area, where they can switch turns. One train set will be on the line, at the time, the others wait patiently. On the left is the original and model of the first generation cab car, on the right the second generation. On the left is the original and model of the TEE, as she was in service in Europe, on the right is the original and model of the Northlander. The Northlander was assembled and painted in Tilburg, the Netherlands. 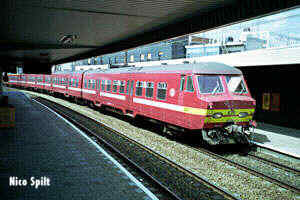 She test-drove on Dutch rails, before shipment to Canada. From Mr. W. Waleboer I received some model photos from Belgium equipment, which can be found in Belgium, after crossing the border and those model will look perfect on my layout. 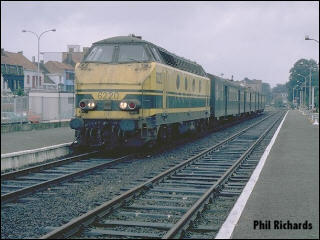 Three Belgium locomotives, two road diesels and one switcher. They are class 55, 62 and 73-74. With the following three drawings I show my idea of the module. I most likely use Fleischmann Profi Track, I have enough to make a small module like this one, but not for an entire layout. The depot is finished, I only need to find and make some commercial posters and accessories. I kit bashed this depot with two Pola station buildings, as you can see in this article about kit bashing. A real romantic Belgium street with station square, including a french-fries snack bar, and a small industry, across from the depot, will be created. A roadway with underpass is also planned to be added at the right side underneath the railroad tracks. The visible track at top of the module will be situated in Forrest scenery. 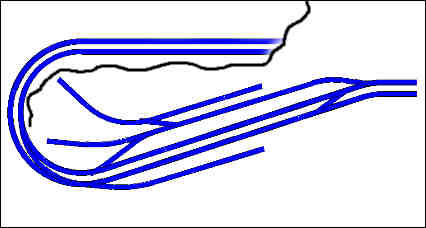 The black line is a divider, which divide the layout in two. The double track on top will be situated in a landscape and is going down towards the staging area. This is the staging area. The three tracks are electronically controlled. of course with "block" section safety control. This is the small depot with some industry. I plan to create a romantic street with, typical Belgium houses. And finally three Belgium model railroad accessories. A sample of Belgium signals, made by Henckens. 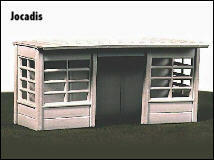 A sample of a Belgium shelter, as they have been used for years at almost every depot. For sale at Jocadis. 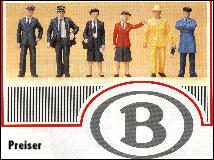 A set of Belgium Railroad employees, made by Preiser. Thanks to eBay I have added some Belgium trains. It's a Lima train set series 800, nickname "Varkensneus" (pig nose), and for the depot I have a Fleischmann old style passenger car and two Liliput freight cars.